A teacher who works with Ben sent me this photo recently. She had taken it a few years ago. Photos can serve as reminders of change and progress. Ben outgrew this Snugseat chair. 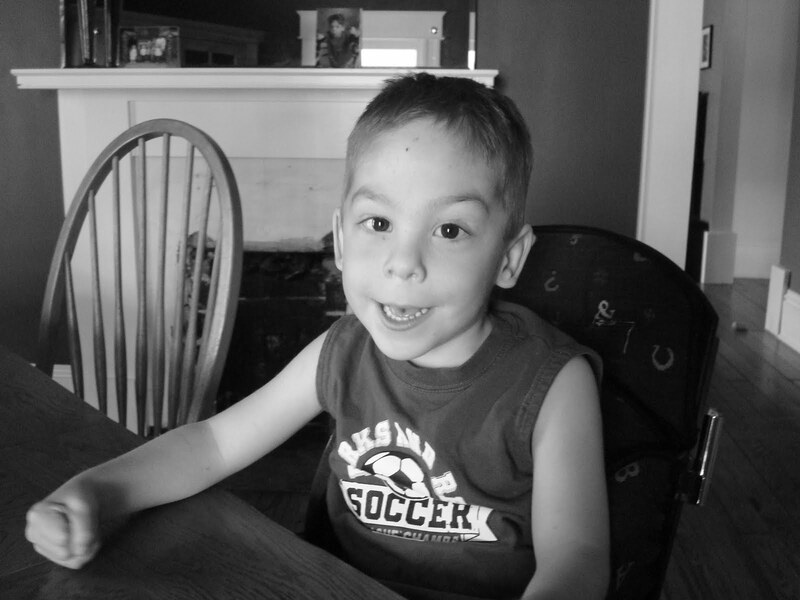 That summer, the staff at camp taught him to sit independently on a bench or in a chair. Three years later, I am reminded that I wish we still had that chair. Ben does not need it because he cannot sit in a chair, but because he will not. Progress comes with its own difficulties. I will take the progress and just keep smiling at the irony. At the time that I write this, Ben is in his 6th day in underwear. If you have followed us from the beginning, Ben started serious toilet training last August, at the end of camp. He wore a pull-up over underwear. For the entire school year, he has done an incredible job of using the toilet, staying dry and even trying to let us know when he needed the facilities with a Big Mac button, crawling to the bathroom or just yelling his head off. At the start of camp, with the advice of Ben's behavior therapist, Ben went cold turkey wearing just underwear. He is doing a great job. And if nothing else, his little bottom has got to be cooler! Ben made this lighthouse at school using real sand for the land. They look like how I feel. It has been a tough transition for me from school to summer. I play chauffeur for much of the day taking kids to and from camp. During the year, my goal is to get in my car as little as possible. The hardest schedule change has been that Sean, our two year old, has decided to stop taking naps AND he can climb out of the crib. Of course, Sean still needs the nap and his behavior reflects it. My world has changed dramatically. The precious time I had to myself in the past to get "stuff" done and recharge my batteries has diminished. One day, I will learn to change with the tide. I may fight it every moment of the way, but it will happen and I will eventually find peace. Perhaps. At least tonight is "Date Night." This morning, I was supposed to run a 5K to meet my June goal for the 12 Race Challenge I set up for myself last December. On Thursday, I read an email letting me know that a mistake had been made with the date of the race. It was actually scheduled for October 23. Quickly looking for another race this weekend, I found two options. One was canceled due to low registration. The other was a race in Puerto Rico. Ryan said I could use my birthday money to fund the trip. We have a long standing joke about how the cash gifts I receive for my birthday never seem to run out. Ryan thinks I am pulling a fast one. What can I say, I am frugal! And in fact, I do have some left of said birthday money, but not enough to jet off to an island. Left with the YMCA treadmill or a run in the 'hood, Ryan offered to map out a course for me. I pictured myself tripping over my own feet while trying to read a map telling me which direction to head. I decided to just run my regular 2 mile route twice. Running, I imagined fans lining the streets, water stations along the way and police officers directing traffic at every intersection. In reality, it was a quiet warm morning. I did hope that Ryan and the kids might be sitting on our front porch cheering me on at the last stretch. Turns out, I had to imagine that too. Special Exposure Wednesday: Award Winning! Ben received an award for Excellence in Story Based Lessons at the End of Year Awards Ceremony at school. The boys made these t-shirts at our son, Logan's 5th birthday party. T-shirts are from the Dollar Store, paint from Michael's and iron-on lettering from WalMart. Easy and inexpensive activity to do - especially outdoors! Kept the 12 children busy for quite awhile. Ben used his hands to squeeze the t-shirt to get his effect, while Logan used the "squirt the paint bottle" method. 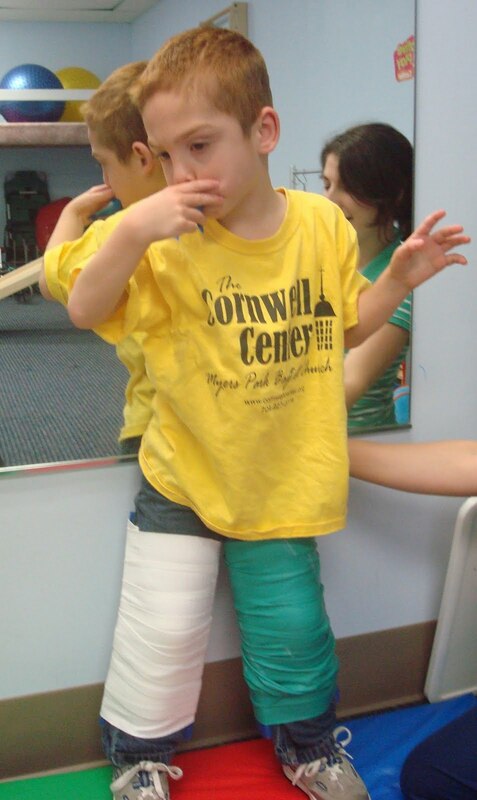 Ben is making remarkable progress in physical therapy. In these photos, they are attempting to get Ben to stand unassisted. 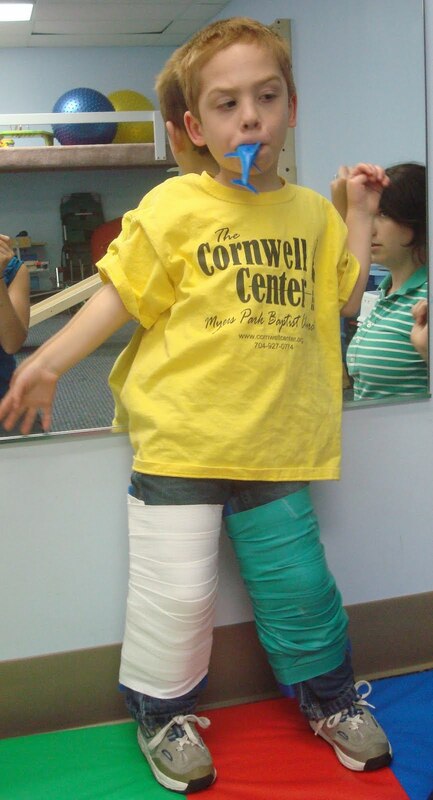 The therapist wrapped Styrofoam around his legs for stability. If you are wondering why Ben has a rubber shark hanging from his mouth...it is to divert his attention from what he is actually doing - standing on his own! 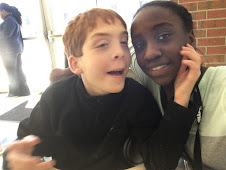 Since Ben's original swim instructor moved on to Harlem, NY, he has had a new team - Nicole and Jackie. They love him and take care to teach him in a patient and positive manner. Ben is getting stronger in the water and out as a result. Ben has been to Tweetsie Railroad at least three times and this year was the first for him to ride by himself. Teary moments for parents and grandpa. Dare Devil in the Making? Ben and I had Memorial Day Weekend to ourselves. My husband took the younger boys to the beach, while Ben and I stayed in Charlotte. We had so much fun. 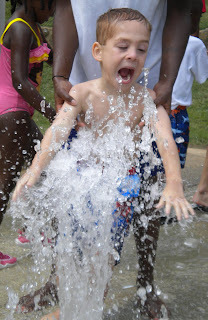 We visited the US National White Water Center and listened to Exit 54 there. While the band was on break, Ben led me over to the structure pictured below. I did not realize that he had been watching people "zipping" down from the top during the concert. Ben walked me to the front of the line as if we were next to participate. Luckily I was able to tell Ben he did not weigh enough...yet! This is the ribbon Ben received at the Special Olympics. Not exactly artwork - but definitely inspirational. I think we can all live by these words. Last November, Ryan and I were given a free night in Myrtle Beach, compliments of HOPE (Helping Outcomes for Parents of Exceptional children), a new non-profit organization. I wrote about our experience here and included some links to articles about the effects on parents' relationship when raising a child with special needs. We all know marriage is continuous hard work without any extra set of issues. Add any type of problem and the stress is multiplied. Zondra Moss, the CEO of HOPE, submitted an application to The Pepsi Refresh Grant last month. Fortunately, HOPE was accepted as one of the 1000 applications for the 30 day voting process. The top ten ideas will receive a $50,000 grant. Imaginon is a public library for children. It is a great place for Ben to run around in his special TAOS walker, have a snack and meet new friends, some real, some not. Logan enjoying the whole camping experience. I love everything about camping - the campfire, the s'mores, the hiking, looking for frogs and other small animals - except the sleeping part, oh and the bugs. Within 30 minutes of our house, we have a county park that for $36, you can get a site with a 9'x12' tent already assembled with two cots inside. Not having camped before with all the kids, we decided this may be a good trial run for us. If disaster struck, we could make a fast getaway. For good measure, I also invited Kim, a teacher who works with Ben, and her husband for extra help and moral support. All went great until it was time for sleep - between Sean running in circles around the tent until midnight, teenagers playing a very loud game of hide-and-seek, Ben waking up to use the bathroom at 2am and Logan yelling at 4am, "Where am I?" – no one really slept, despite the Benadryl everyone received before bedtime. Next time, yes there will be a next time, I think we will get to the campsite early - do all the things we enjoy and head home at 10pm for sleep in our own beds. That's still camping...isn't it? Sean with a mouthful of cookies.